Scientists at Johns Hopkins University are developing a new early warning system for seizures that is sensitive enough to detect imminent seizures without setting off a large number of false alarms. The software may someday be embedded in a microchip that would continually check electrical activity in the brain and launch electrical stimulation whenever a seizure is beginning to form. At the 2009 JavaOne Conference in June, Visuvi Inc., a Redwood City, California-based company developing visual search solutions, announced a Java-based visual search technology that integrates a JavaFX front-end with PathXchange, a Web 2.0 pathology portal. The Visuvi Java application enables medical professionals to take a digital biopsy image of 50,000 x 60,000 pixels (that’s 3000 mega pixels) and search medical images in leading databases for similarities. The power of this technology is that the medical images in the databases have corresponding case information. Thus, images that are found to be similar also provide information on patient diagnosis, treatments, outcomes, etc. This is particulary useful in oncology since, in more cases than you’d expect, pathologists disagree on whether a particular image shows cancer or not [1-3]. By comparing pathology images, the technology greatly accelerates the review process and allows a diagnosis to be more objective than what is currently done. Check out their demo at the conference in the video below. James Gosling (the inventor of Java) was clearly impressed with the significance of the technology. Chris Boone, CEO and president of Visuvi, and Florian Brody, VP Marketing, highlighted and captured a section of an actual prostate cancer biopsy image and searched 90,000 images in 0.3 seconds to find related patient cases. PathXchange is a not-for-profit professional networking portal for the global pathology community. PathXchange brings the field of pathology into the digital age with Web 2.0 features designed to promote exchange of pathological cases, knowledge and information, combining the elements of a case gallery, community content contribution and professional networking. Farmer et al. Discordance in the histopathologic diagnosis of melanoma and melanocytic nevi between expert pathologists. Hum Pathol. 1996 Jun;27(6):528-31. Lettieri et al. Discordance between general and pulmonary pathologists in the diagnosis of interstitial lung disease. Respir Med. 2005 Nov;99(11):1425-30. Epub 2005 Apr 21. Lodha et al. Discordance in the histopathologic diagnosis of difficult melanocytic neoplasms in the clinical setting. J Cutan Pathol. 2008 Apr;35(4):349-52. Following a discussion on Twitter, Dr. Chris blogged about essential medical software and invited others to share their “core apps”. I thought I would add to the discussion with my own essential programs, albeit with a genomics/pre-clinical research bias. First: a little about me. I’m a bioinformatician working in neuro-oncology. Bioinformatician: an individual that uses information technology as applied to the life sciences, especially the technologies used for the collection, storage and retrieval of genomic data. Last month, an article debating Scientist vs Developer in Bioinformatics was posted on Web 2.0 and Semantic Web for Bioinformaticians. I would fall into the first category (Scientist Bioinformatician), as I’m interested in testing hypotheses and discovering new knowledge. A dry lab scientist, working in wet lab, the WB is the support for all things computational biology in the laboratory. The WB is familiar enough with Perl to create simple scripts, but the real strength of the WB doesn’t lay in writing code, but rather in using tools. While most bioinformaticians are familiar, in theory, with how to find a gene of interest, the WB uses these tools day in and day out — the WB puts many to shame on basic bioinformatics. While others have their head in the clouds thinking about theories and algorithms, the WB is getting his hands dirty with real data as it is being produced. The majority of my time is spent performing Functional and Comparative Genomics on DNA microarray data. The information I analyze is used to further our understanding of the molecular pathways altered in neurofibromatosis and to identify potential therapeutic targets. Note that I’m an Apple user (MacBook 2.16 GHz Intel Core 2 Duo, 3 GB 667 Mhz DDR2 SDRAM), so all my core apps are for a Mac. With all of the visual data I manipulate, a good monitor is essential; I use a Samsung Syncmaster 245BW 24″ LCD monitor. Finishing out the hardware list is an Apple wireless keyboard and mouse. GeneSpring GX provides powerful, accessible statistical tools for fast visualization and analysis of gene expression data. Sure, there are more powerful alternatives (I hear all you R users grumbling …). Nevertheless, the ability to quickly manipulate gene lists and display gene expression patterns makes GeneSpring GX an essential core app for expression analysis. I use R in conjunction with Bioconductor, an open source and open development software project for the analysis and comprehension of genomic data, principally for data normalization prior to import and analysis in GeneSpring. I routinely use custom CDF ([Gene] Chip Definition File) libraries, so R/Bioconductor is absolutely essential for data preprocessing. Genomics analysis requires manipulation of many, many data points (100 samples x 56,000 probe sets = 5.6 million data points). Sorting, searching and organizing the data can all be accomplished with Microsoft Excel. A necessary evil. Skim is a PDF reader and note-taker for OS X. It is designed to help you read and annotate scientific papers in PDF, but is also great for viewing any PDF file (think Preview on steroids). Unlike Adobe Acrobat, it’s FAST. I’ve tried a number of applications to organize and tag scientific journal articles. Keeping up is an impossible task. I’ve tried several applications (yes, I’ve even tried Papers). However, for those of us that write research articles for publication, a reference manager is an essential app. Bookends is bibliography software that can also organize PDFs. The interface isn’t flashy but it’s a powerful piece of software. You can perform PubMed searches, retrieve references and associated PFDs and create static, smart and virtual groups to organize and find information in your personal collection. And it’s FAST. Bookends uses Spotlight to search within PDFs. You can search titles, abstracts, authors, journals, dates and more. Bookends is actively supported and has a useful user forum. Speaking of writing research articles for publication, Microsoft Word is another necessary evil. I’m writing all the time and a powerful word processor is a must. Yes, another Microsoft app. Scientists are always talking about their research and pictures speak louder than words. Especially in my position as a Bioinformatician, I need software that allows me to display and present information; Microsoft PowerPoint is that application. I should pause here and mention out that I’m testing Apple iWork to replace Word and PowerPoint. The entire Office suite isn’t optimized for OS X (it really runs poorly) and both Pages and Keynote — iWork apps — rival the utility of Word and PowerPoint. I spend a great deal of time analyzing large high-throughput gene expression data sets. Each analysis involves addressing several hypotheses and establishing biological meaning from the data. I rely on a number of web applications and databases to identify genes or gene sets associated with a particular phenotype (meaning an observable characteristic) and to identify enriched biological themes, particularly gene ontology (GO) terms. Efficient literature search is essential to the practice of Evidence-Based Medicine and to Biomedical Research. PubMed provides free access to MEDLINE, one of the largest searchable databases of biomedical research articles. An absolute necessity. The Database for Annotation, Visualization and Integrated Discovery (DAVID) 2008 provides a comprehensive set of functional annotation tools for researchers to understand biological meaning behind large list of genes. I’ve tried various other tools for functional annotation analysis, but I find DAVID the most comprehensive app on the web. DAVID is owned by the NIH and is under continuous development and improvement. OMIM (Online Mendelian Inheritance in Man) is a comprehensive and authoritative compendium of human genes and genetic phenotypes. The full-text, referenced overviews in OMIM contain information on all known mendelian disorders and over 12,000 genes. OMIM focuses on the relationship between phenotype and genotype. I frequently link to OMIM for genes discussed on Highlight HEALTH. No, not the restaurant. Information Hyperlinked over Proteins (iHop) provides the network of genes and proteins as a natural way of accessing the millions of abstracts in PubMed. By employing genes and proteins as hyperlinks between sentences and abstracts, the information in PubMed becomes bound together into one navigable resource. I’m using Web 2.0 tools more and more in my daily workflow. Many have become indispensable for organization and communication. 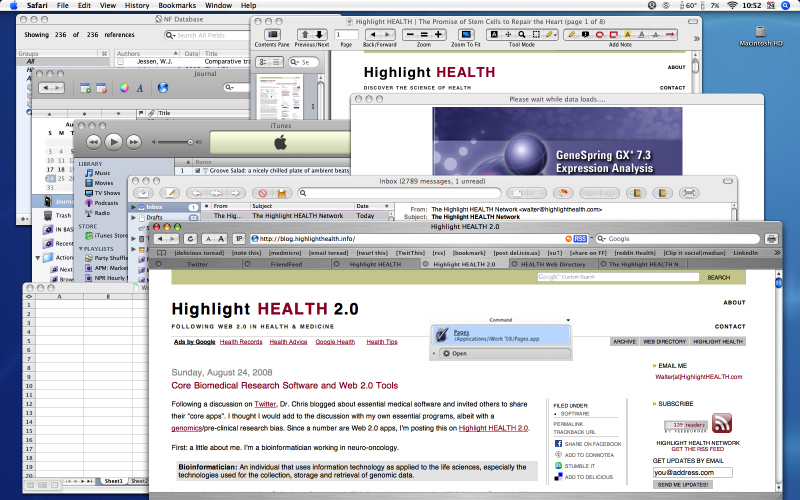 Highlight HEALTH runs on WordPress. I’ve used WordPress for a couple of years now and (between plugins and hacks) it does everything I need it to do. I gave up trying to manage browser-based bookmarks some time ago. Delicious.com allows users to tag, save, manage and share web pages from a centralized source. The latest addition to my workflow is the use of the “toread” tag to find bookmarked articles of interest for later review (since emailing or saving links to the desktop is inefficient). I use RSS frequently, not only for blogs of interest but also to keep up with biomedical journals (current issue table of contents RSS), PubMed searches (to keep up with the latest published research in my field of work), LinkedIn updates and news. I try not to depend on Google too much, although that can be difficult nowadays. For RSS, I use FreshReader, a web-based, server type RSS and Atom feed reader. Fed up with slow feed readers? FreshReader is FAST. FriendFeed is becoming an excellent social networking tool, since several rooms have been setup for life science researchers and programmers. In addition to being a social aggregator, FriendFeed has comment streams that allow you to contribute to the conversation. In many cases, entire discussions are held entirely on FriendFeed. Twitter is also becoming a useful tool to communicate with other doctors and researchers (most are also using FriendFeed as mentioned above). Twitter allows you to keep up with people that share similar interests. If you use both both FriendFeed and Twitter, I’ve found a convenient tool. MySocialChatter.com brings FriendFeed and Twitter together in a single web page using frames and automatically refreshes every few minutes. It’s quite useful for keeping an eye on the conversation, is easy to read (compared to some desktop apps) and is non-disruptive. Act without doing. If you use a Mac, Quicksilver is simply a must have. Move over command-tab (that’s alt-tab for all you windows users), Expose is AWESOME. Mail.app, my e-mail program of choice. The web, Apple style. Safari with the Saft extension is my internet browser of choice. OS X optimized and FAST. My digital notepad. Journler is a daily notebook and entry based information manager. Never again do I have to deal with miscellaneous text files scattered across my hard drive or random bits of text emailed to myself. That said however, I am looking into Evernote to supplement (and possibly replace) Journler. My iTunes plays mostly ambient, new age music. I frequently work with Groove Salad or Radio IO Ambient playing in the background. So, there you go. There’s many applications, but since I’m a bioinformatician that should come as no surprise. I think you’ll get a better idea of who I am and what I do from the software tools I use and rely on everyday. These are my core biomedical research apps. Are you a physician or biomedical scientist? Is there software or Web 2.0 tools that you couldn’t live without? What are your core apps? Share in the comments below or write your own post and link back here.